This is a great budget priced vinyl with light embossed finished surface. Ideal for uses such .. This vinyl has great flexibility. It's simple to sew, yet it's still tough and waterproof. Use th.. This vinyl is flexible and versatile. It's simple to sew, yet it's still tough and waterproof. 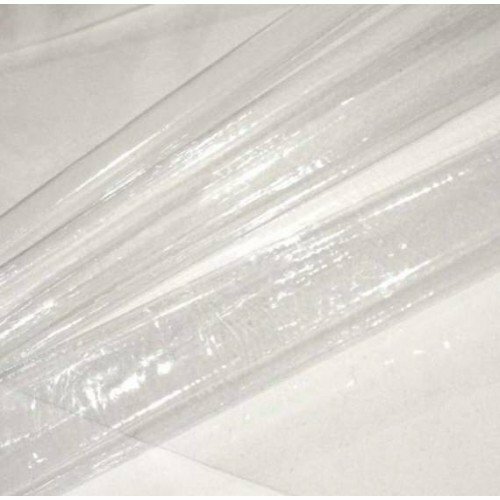 Use this vinyl to make cosmetic bags, garment bags, or tough plastic shopping bags. It's a quick way to waterproof furniture or provide a dust cover for electronic equipment. In the home office, this vinyl is the ideal cover for tables, and other items that may accumulate dust. Cut it, sew it, or tape it, this vinyl is flexible, and tough enough for use outdoors to cover items in the weather. Cleaning guide: Clean with damp cloth. We recommend rolling up the clear vinyl before storing. This vinyl is the ultimate in flexibility. It's simple to sew, yet it's still tough and waterproo.. This vinyl is flexible and versatile. It's simple to use, tough and waterproof. Suitable for use ..